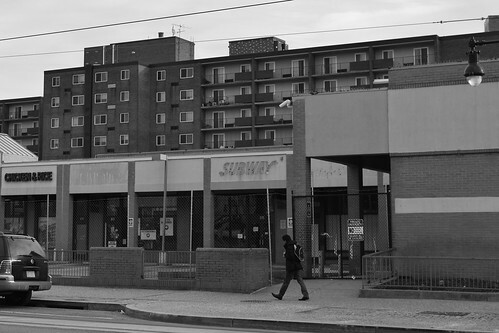 The permits have been issued for demolition of the H Street Connection (south side of the 800-900 blocks of H Street). The Washington Business Journal advises that the new mixed-use project on the site (419 apartments, over 44,000 square feet of retail, and buried parking) is expected to deliver in late 2019. WBJ writer Michael Neibauer tweeted about a demolition event July 20th. The website for 901 H Street even features a live webcam so you can watch the Connection come down in real time. but, good riddance. i think the only better demo day on H was when Murry's/H Street Storage came down. next is the autozone... i think their lease is up in 2017, if i remember correctly. is that true about Autozone? I thought they had quite a few more years to go. Thank goodness and thank you for the update!! I have been wondering when this was going to happen. I moved into the neighborhood 10 years ago and there was talk about the strip coming down so it has been a long time coming. It is about time! It was supposed to be one of the first new developments on H, but has taken forever and a day. Any word on possible tenants? No it cannot be! I was a frequent Marvelous Pizza customer and the pies there will be missed! The most scrumptious pizza in DC. I'm not sure of when it opened. 2007? Anyone know? Jul 13, 2016, 11:08:00 AM"
Lay off the crack pipe, bruh. The Auto Zone was the only business on H street when we moved her in 2004. It appeared to have been pretty well-established at that time. Marvelous may not have had the best pizza, but they delivered late and they'd deliver ben and jerry's ice cream. For that alone I shall mourn their passing. Autozone has been here for a long time. We've been here since '99 and it was here then. The Miller brother bought the property in 2009 or 10 maybe and it was announced at that time the lease was ten years. I can't remember exactly. and caused trouble to passers by. They also drove that furniture store 8th and H out of business. That mall had a lot of trouble and i'm afraid it served as a crime anchor. sorry to say, but it's not always about race. i don't care what color the low lifes are that hang out there and do drugs and harass people.... yeah, yeah.... it's not their fault, they had a serious lack of opportunity, etc. but that is not going to be fixed during my lifetime. meanwhile, i expect security and respect. if you have a great solution, please let us all know. thanks in advance. Uh let's not use super racist language, regardless of what race you say you are, or what you think about neighborhood development. To 7:04 Where have you been sad to say but it is always about race, and when its obvious to everyone its not about race....it is still about race. Race the excuse card that keeps on giving. I'm not sure where the ire against the AutoZone comes from. Sure, the H Street Connection was an anchor for crime, and hopefully the redevelopment of that block will change the tone, despite the major bus stops in the area. But what's wrong with the AutoZone?? I have never been confronted with anyone loitering around that store or otherwise making me feel uncomfortable, it is very conveniently located for locals trying to grab something for their car or for those that are leaving the city via a major throughway, and the people that work there are really helpful. Just because it's not a new condo or some hipster restaurant, doesn't mean we should all wish for the demise of a legitimate and well-run business that serves a need in the community.